This AppleScript exports Indesign documents to PDFs and/or Images (JPEGs and/or PNGs) with the following features! Each page of the Indesign document can be exported to it’s own specially named PDF, JPEG or PNG. Indesign filename & suffix-of-your-choice & page number. CSV or text file (names separated by returns). The content of a character style from each page. The content of a paragraph style from each page. You can export images and have them combined into a single PDF meaning that every page of the PDF is a rasterised image. The script knows the file path of your Indesign file and can export the files directly to it. Otherwise the script can automatically file it into a sub folder of your choice. You have the option to export all the Indesign documents that are currently open. Choosing the same settings as last time? Just hit return. For example, set up your favourite PDF export to quickly export low resolution PDFs to the Indesign document folder. Click on the image below to see a bigger version in a new tab. The script needs the Yosemite operating system or later. 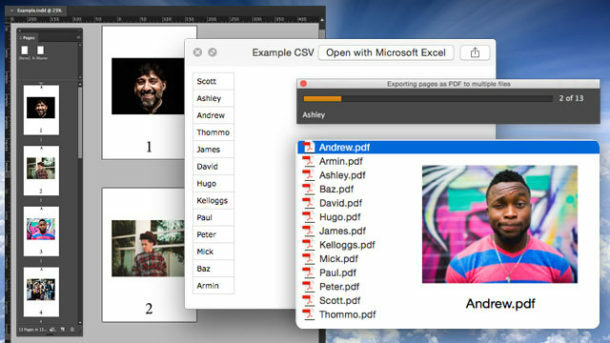 If you choose a CSV for the naming of the images or individual PDFs, it should only have just one column, that being the list of names and no column heading. There should be at least as many names as there are pages in the Indesign document. If you choose a text file, the list of filenames should each be on their own line. Alternatively, choosing a character style or paragraph style for the naming of the exported images or individual PDFs can be useful if you have a title on each page. For example business cards or invitations may have include person’s name. Format the text in your chosen style and the script will use that text for the name of the file for that page. The trial version has full functionality but with a limitation of 10 pages at a time on the separate pages option. The paid version has no limitations and comes with free updates as new versions are developed. 6 July 2017. Version R8. Fixed an error with the page range option. 12 July 2017. Version R10. Added the option to export PNGs. 3 November 2017. Version R12. Added the option of leading zeros for numbered pages choice. 17 July 2018. Version R13. Custom page names (section prefixes) are now supported. The leading zeros feature has been removed since page numbering styles (e.g. “0001,0002…”) can be applied in the document’s Numbering and Section options. 22 July 2018. Version R14. Improved support for character styles and paragraph styles. Hello. You have written a great script. Congratulations! But I am trying to export each page individually and it always exports all the pages in the same pdf document. It does not create individual and separated pdf files for each page of the indesign document. I am working with inDesign CC 2017. Could you tell me how to solve this, please? Thanks a lot! Hi Luis, thanks for reporting that error. I’ve fixed the page range option in the latest version so it exports multiple single page PDFs and also the correct page range for PDFs and JPEGs if you choose that option. How do I install? Am I overlooking instructions? Is it possible to export interactive PDFs with this script? I’m trying to export PDFs with clickable links. Hi Kelly, if you only need hyperlinks and bookmarks you can set up a PDF preset in the Adobe PDF for print section that includes those features. That can then be used with this script. For all the other interactive features like page transitions and media, you will have to export the document manually because Indesign does not allow saved presets for interactive PDFs. Would it be possible to have a “Check Document Links” feature added? This would make an already great script even greater! Thanks for the feedback Mike, that’s a good suggestion! Hi, is there a way to add single jpgs instead of single pdfs outputs as an option?? Yes the script already does this. Just click the checkbox in the top right hand side of the dialog box. You can save the pages as JPEGs and/or PNGs. Doctor, so much of my life has been wasted… and then I met your scripts. Keep them coming! I have one question on this very useful script — is it possible for the page numbering to appear as the prefix in the file name instead of suffix? This capability would be the cherry on top of a very large hot fudge sundae for me. thanks for the feedback. It’s always great to hear these scripts are saving people time. In regards to changing the position of the page number, there could be many options for example, each filename could start with the page number or have some static text before the page number, and there could be the option of having static text after the page number but before the filename. The same could apply if the page number was put after the filename. In other words, too many options to fit in the dialog box! The best method for custom page naming is to prepare a CSV or plain text file with the list of your page names. Then use this under the CSV option of the script. Hello Can i add the Beeed by export as PDF? Yes, just create a PDF export preset that includes bleed, then choose this preset when you output using this script. Hi drscripto! Great script, thanks a lot! It satisfies my need to export pdf and jpgs in one go. One question: is it possible to fiddle with options to export as jpgs spreads not pages and put in jpg name sequential numbers no page numbers? Hi Andris, I’ve put the option to export spreads onto my to-do list. Also adding numbers to the filename independently of the page numbers is an interesting idea too. Thanks for the feedback! I’m really trying to get this to work for us! Great script, thank you. I feel like I’m close. But I don’t know what to do. I don’t want to use the filename of the document, because we have the spread numbers in the name with the date. Example “0128_04-05.indd” The PDFs are getting named 0128_04-05_01.pdf and 0128_04-05_02.pdf We need them named 0128_04.pdf and 0128_05.pdf Should I be making a CSV file for each InDesign document? I don’t know how to make a CSV file though. Oh, guess what?… I made a CSV file and it works great! I was over-complicating things because it was SO easy. Thank you. Hi Ann, glad to know it worked for you. The CSV is probably the best solution for custom naming conventions. Apart from a CSV it also works with a plain text file, it just has to be a list of names each one on its own line. Once again a GREAT SCRIPT! Thanks for the feedback Ekim. This is a good idea to have the option of a different number of pages in each PDF (not just single pages). But what should the script use to name each 3 page PDF? Hi John, I haven’t given the script the option of outputting spreads yet. Will let you know when it’s done. This script is brilliant – saves me hours and hours of manual renaming. I’m using filenames sourced from csv/text. One improvement for my specific use case – and possibly others – would be to have a prefix (or suffix) as a constant in addition to the variable names I have in my txt file. I create 8 different sized jpegs for use with Google Retargeting and the sizes of each jpeg need to be in the file name. If I could nominate ‘product name’ as a constant prefix (in the script dialogue box) and then append the 8 sizes I have saved in .txt, that woudl be perfect. At the moment, I’m using Find/Replace in the .txt, but if I could leave this file untouched to avoid inadvertent changes, that would be perfect. I used csv initially, but the first file name had 3 random characters at the beginning. I tried a couple of things to fix, but couldn’t. No problem for me to use .txt., but just flagging this may be a bug? ?